The atmosphere displays an interesting variety of features. Some of the more spectacular and often feared of these features are the tornado, dust devil, water spout and land spout. They may generally look similar with funnel shaped rotations, but all develop differently. Discussed in this section are the various features associated with each. Because of their complexity, the formation processes are not discussed. 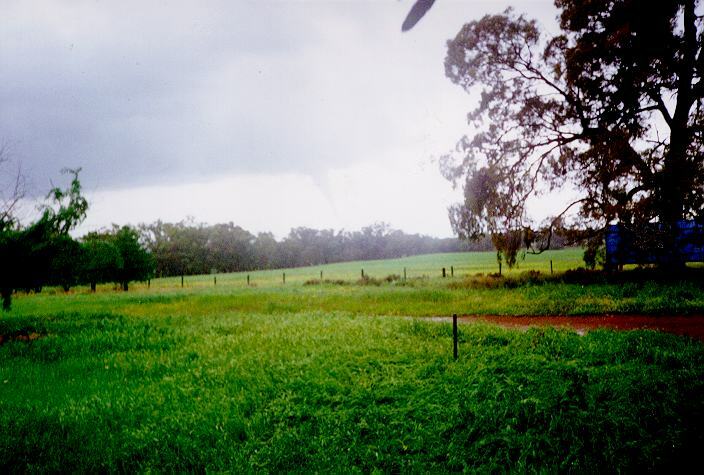 On the 26th October 2007, the author Jimmy Deguara himself intercepted a tornado that caused devastation at Dunoon in northeastern NSW. Hitting a boundary, the circulation developed and tracked along this boundary to become a relatively long lived tornado filled with debris from a Maccadamia Nut plantation. Just after it became a relatively large tornado, the local substation is filmed exploding in spectacular sparks when a sheet of corrugated iron is thrown onto the substation. This video is strictly copyrighted by Jimmy Deguara. Tornadoes represent the most violent rotating systems on earth. Winds around the tornado can rotate at over 300 km/hr. Because of the violent rotating winds, tornadoes can cause extensive damage to trees and buildings as well as lift and throw vehicles. This does of course depend on the severity of the tornado. AT THIS POINT, IT IS IMPORTANT TO REMIND READERS THAT THEY SHOULD NOT ACTIVELY SEEK TO OBSERVE TORNADOES, WATERSPOUTS, LAND SPOUTS, OR DUST DEVILS AS THEY ARE POTENTIALLY DANGEROUS, PARTICULARLY TORNADOES. THIS SECTION WHICH DISCUSSES TECHNIQUES ON OBSERVING THESE ROTATING SYSTEMS AIMS AT ALERTING READERS OF THE MAIN FEATURES FOR IDENTIFICATION SO THAT THE CORRECT SAFETY PRECAUTIONS MAY BE ADOPTED WHEREVER NECESSARY. Many people have not experienced them and therefore most probably may not know how to identify them if they do occur. Such events can develop so rapidly such that a lack of awareness can mean the difference of being prepared or unprepared. Tornadoes are not only dangerous because they can pick you up and throw you, they are also dangerous because of the debri they can hurl at you. This is even the case up to a small distance away from the tornado. Debri can be taken to huge heights and dumped hundreds of metres around the tornado path. Tornadoes occur from large, very severe thunderstorms. The largest type of thunderstorm on earth is known as the supercell. Due to the overall rotating structure of supercells, they are responsible for most of the reported tornadoes as well as the most violent. 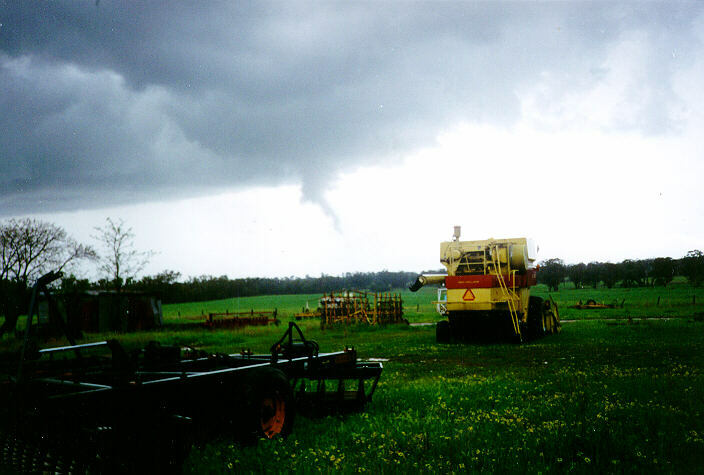 Tornadoes can also occur in other severe thunderstorms known as multicells. Severe multicells differ in their structure from supercells in that they are normally not associated with a rotating structure. Multicell structure involves the development of newer adjacent cells as other cells die. Tornadoes that occur will normally develop in the mature or developing cells. Although the dynamics of tornadic development are very complex, the visible features of tornadoes are generally similar. 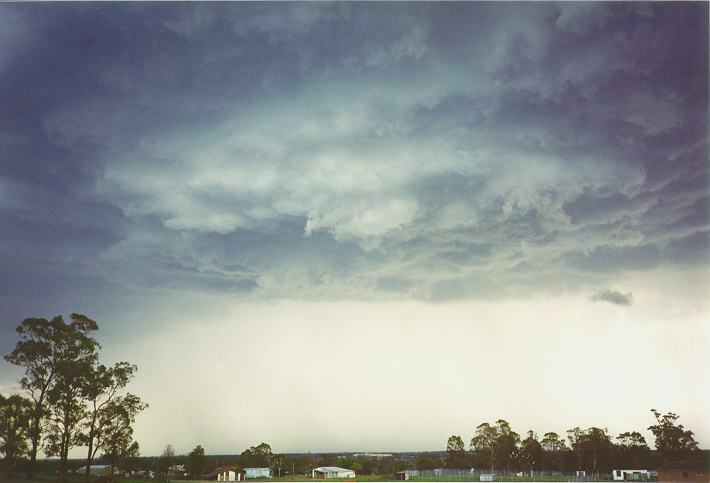 MOST tornadoes develop from lowered rotating bases known as wall clouds. 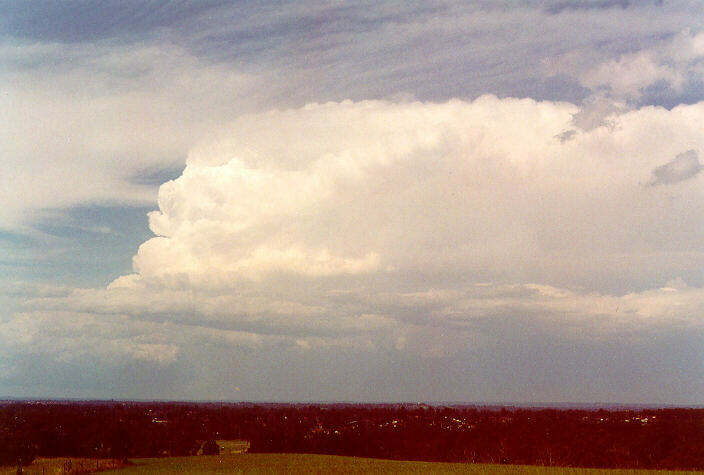 These wall clouds are normally located at the northwestern section of thunderstorms in the southern hemisphere and in the southwestern region of thunderstorms in the northern hemisphere. This region of the thunderstorm is known as the flanking line which consist of a line of large cumulus decreasing in size outward from the rear of the storm. Even though most tornadoes descend from wall clouds, there are occasions where tornadoes descend straight from the thunderstorm itself with no wall cloud. 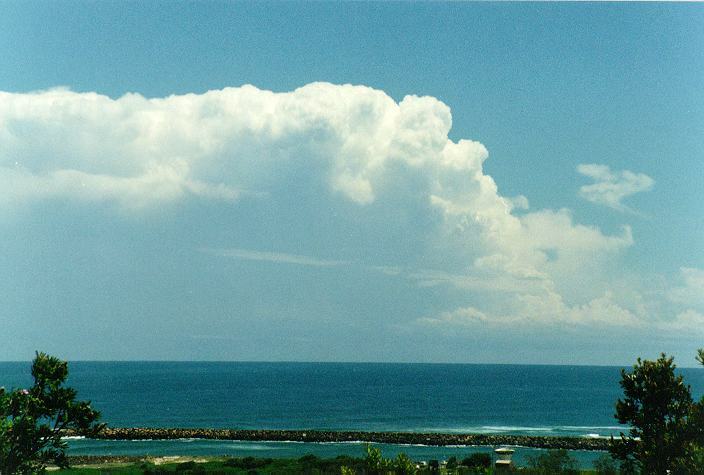 The wall cloud region is usually a region with little or no precipitation. 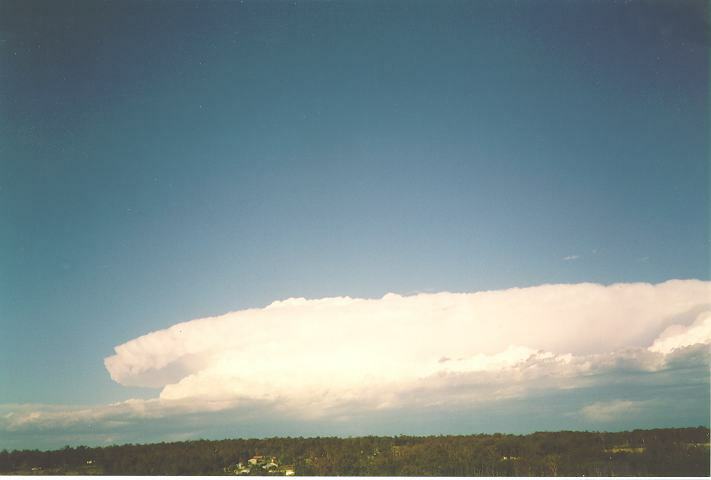 As a supercell passes over, an observer notices an extensive anvil becoming thicker and gradually darker. This is then followed by a shelf cloud or roll cloud in the region of the precipitation cascade. As this approaches, small to medium sized hail will begin falling followed by the large to giant sized hail. Some heavy rain will also fall. Heavy precipitation in supercells are normally concentrated in different areas of the storm with hail concentrated in other areas. Once the precipitation and hail ceases, most people seem to think it is all over. It is around this period where tornadoes and the associated wall clouds may occur. This of course depends on the tornado and associated wall cloud being separate from the precipatation region. Sometimes, precipitation gets wrapped around tornadoes and they will then become virtually invivsible. Nevertheless, it should be noticeable with a roaring sound like an approaching train commonly observed by most affected by tornadoes in the past. Once a wall cloud has been observed, an observer may notice a funnel-shaped rotating spiral column known as a funnel cloud beginning to descend. This represents the next step in the formation of a possible tornado. 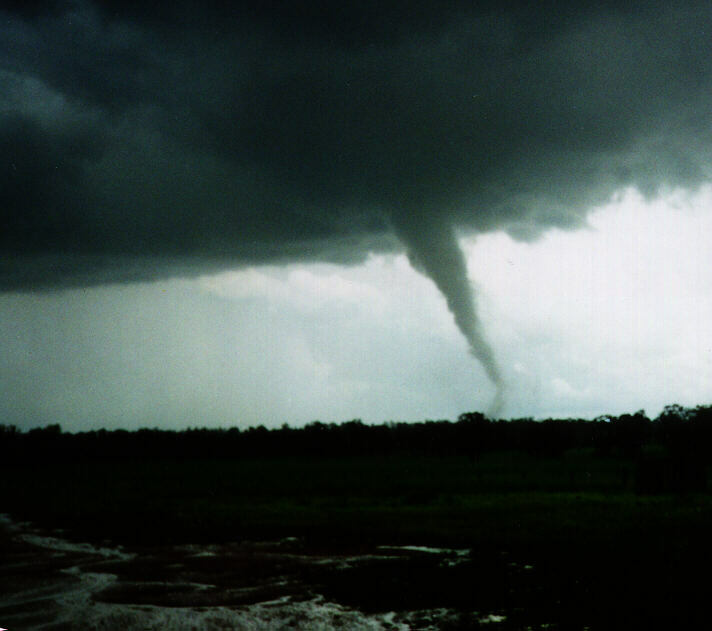 A tornado is defined as a funnel cloud that touches the surface picking up debri and dust. This is often referred to as 'touch down'. The funnel can vary in colour typically a bluish-grey depending on the amount of moisture available to condense as well as the dust and debri. It also depends on the location of the observer. A greater contrast is necessary to observe a tornado. A light coloured tornado observed with a light coloured background such as sunlight will be difficult to see. Conversely a light coloured tornado with a dark background such as a precipitation cascade will make it easier to observe. If there is insufficient moisture, the main funnel section of the tornado joining the wall cloud and the ground may become invisible. This is a very dangerous situation and therefore means that an observer should look at the ground below the wall cloud to see if there are dust whirls or debri in order to determine if there is a tornado. Once on the ground, the tornado will move with the storm. The tornado now is in its mature stage and remains so whilst it remains stable. The larger the cone shaped funnel, the more stable and severe the tornado will be. Tornadoes vary in widths from a few metres to almost 2 kilometres. The most severe tornadoes are more than a few hundred metres wide. This difference in width will vary the appearance and visibility of tornadoes. A large tornado will appear wide with the width of the funnel decreasing towards the ground. A narrow tornado will appear more like an elephant trunk. As the tornado moves with the storm, the base of the tornado will tend to tilt away from the wall cloud or from where it descends. This therefore gives some indication of its direction. An approaching tornado will appear to increase in vertical length. It will also tend to widen and not move to the right or left. If the tornado is widening but tilted slightly to the right or the left, it will normally move in the direction of the tilt. When observed from the side, there will be a slightly greater tilting but the tornado will remain fairly constant in width and height. From the rear, a retreating tornado will appear to decrease in vertical height. The same rules apply in terms of the tilting. If there is no tilt, the storm will retreat directly away and decrease in width. If there is tilting to the right or left, the tornado will move in that direction. One thing again must be stressed, there sometimes is a tornado and it is not visible. The direction of movement then must be determined by observing the wall cloud and debris at the base. If a tornado is approaching (or even in the vicinity), it is time to get away from it if you could or if possible take cover in the smallest room in the centre of your house. In the United States, the region where tornadoes occur most frequently (known as 'tornado alley'), underground shelters are used for safety. For better information on safety precautions associated with tornadoes, contact your local emergency authority. The last stage in the tornadoe's life is the decaying or 'rope' stage. This is a peculiar stage where the tornado appears like a rope. The tornado will eventually become more unstable and then disappear. Even though the tornado normally is weaker in this stage, it still is very dangerous. It also may be difficult to determine its path. The severity of tornadoes vary remarkably. There is a scale which was developed by Fujita from his studies on tornadoes and associated damage. It is known as the Fujita scale. This scale varies from F0 to F6, where F0 represent the weakest tornadic strength with minimal damage and F6 represents the strongest tornadoes with total destruction. It is believed that no tornadoes have reached F6 intensity, but F5 tornadoes have been observed mainly in the United States. 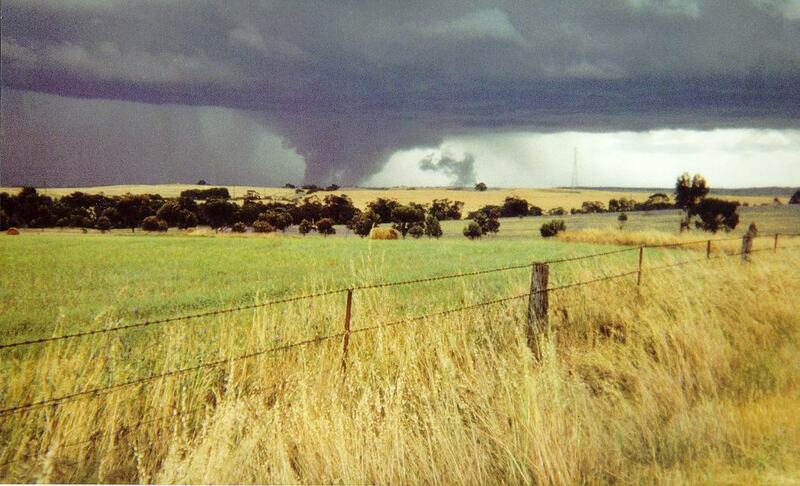 In Australia, tornadoes are normally weaker but there are exceptions. I have been told of a tornado with a possible F5 intensity smashed through Bulahdelah in northern NSW on the first of January 1970. The studies of the damage of this tornado suggests it had a track 22 kilometres long and reached a width of up to 1.6km! It passed through unpopulated area but still levelled an estimated 1 million trees. Another tornado with an F4 intensity in the Jarra forest of southwestern Australia also levelled trees along a path of about 30 kilometres. Dust devils are rotating columns of air that can occur in hot regions around the world. Dust devils can occur as a result of the movement created by large trucks passing over a hotter surface such as a road. They may also develop in the vicinity of local thunderstorms. Even though they are not regarded as highly dangerous, they can become hazardous to light aircraft and other light vehicles. Severe cases can cause damage to houses and trees. Their appearance is determined by the type of dust and light debri picked up. The red brown soil in the Australian deserts give the dust devils there a red brown colouring. Dust devils do not last long but other dust devils may develop by the same source causing the original ones to develop. They are typically up to several metres wide at the base and can lift dust and debri up to a few hundred metres in the air. Their movement is determined using similar techniques to those discussed for the tornado. The only difference is that there is no wall cloud and they do not descend from the cloud. 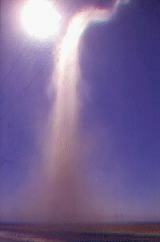 Whirl winds as they are known in Australia are just dust devils. There seems to be different terminology used in different parts of the world and whirl winds have been associated with the tornado and so on. Water spouts are rotating columns of air similar in appearance to that of the tornado. They develop over warm ocean currents during unstable conditions or as cold front boundaries pass over the ocean. These are not very dangerous but can affect boats and yachts. Because they are over the ocean, they do not pick up debri but water spray is observed at the base. 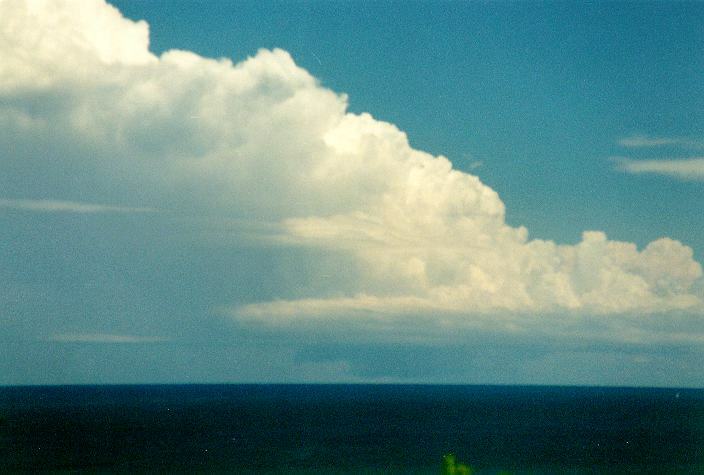 Water spouts can develop over the ocean and move over the land. They are then called tornadoes. It is here where water spouts can be dangerous and has caused extensive damage to trees and buildings as well as over turn caravans in coastal communities. Once on the land, they dissipate fairly quickly. On the ocean however, they can last much longer. 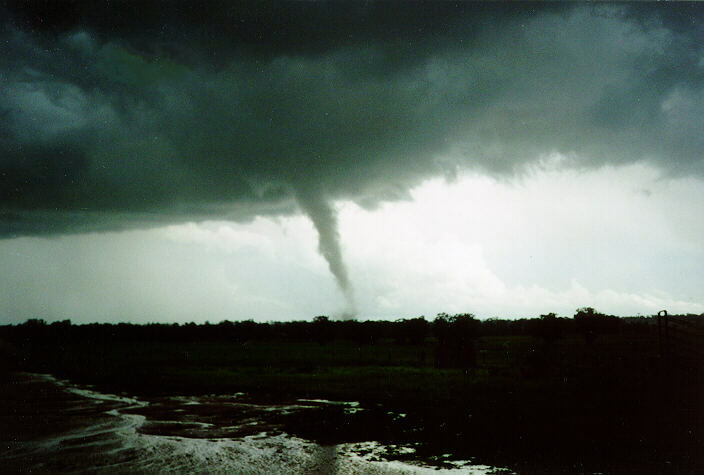 Sometimes, tornadoes form over the land and pass over a lake or the ocean. 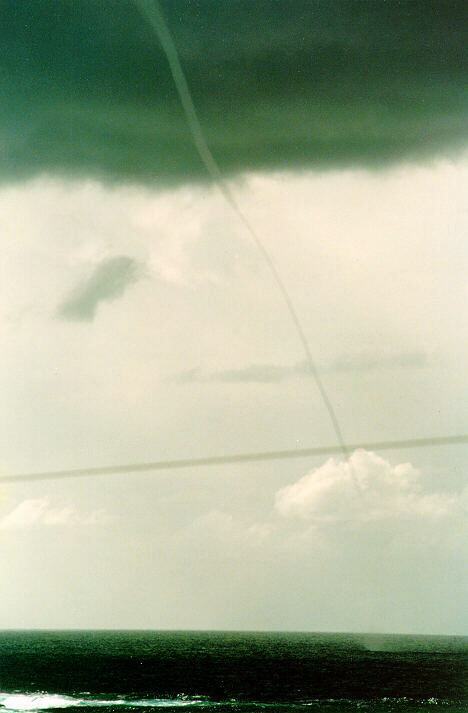 These are then called water spouts despite the difference in the formation processes and dynamics. Land spouts are columns of rotating air similar to water spouts but on land. They differ in their formation from tornadoes and are not as severe. The rotation begins in unstable conditions under cloud over the land. 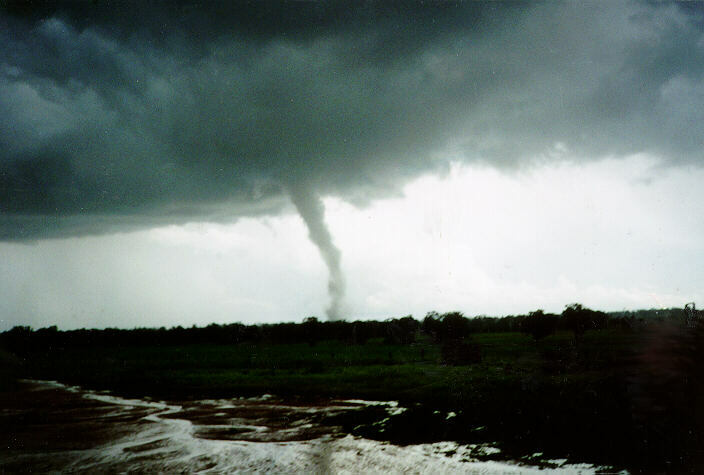 Observational features determining movement are similar to those techniques of the tornado.